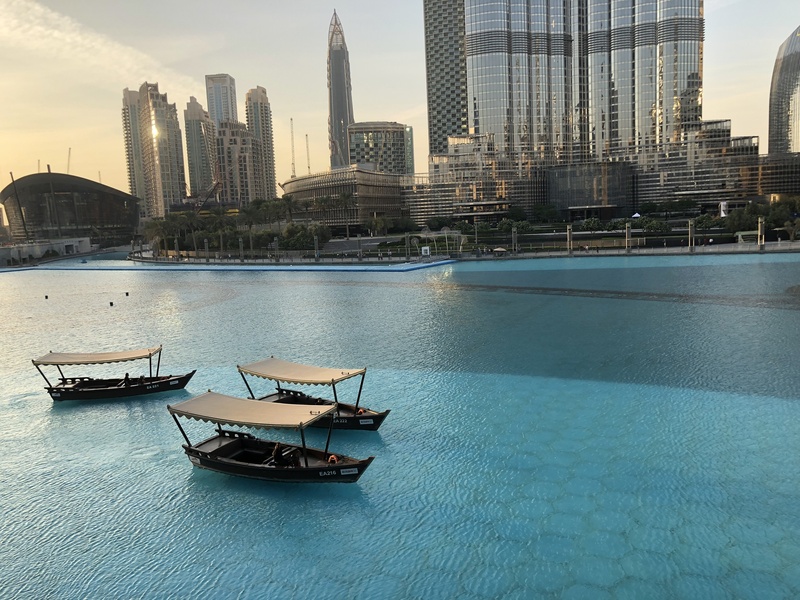 Even surrounded by water – which in Dubai, you commonly are – still, you can feel it: the dryness of the Arabian Desert the city is built on and within, second in size only to the Sahara. Not far from the city’s outskirts is the Al Hajar mountain range, Arabic for ‘The Stone’, and redefining the word rugged. The mountains were recently opened up for hiking by neighbouring Oman, to rave reviews. This was not just the word of the United Arab Emirates’ (UAE) Vice President and Prime Minister but also the word of the Ruler of the UAE – Sheikh Mohammed’s third official title. His edict is being actioned via a 1.3 billion Arab Emirates Dirham (AED) investment in Hatta’s transformation into an eco-tourism hotspot. People don’t think of hiking. They think of Burj Khalifa, the world’s tallest building, its mirrored spear seeming to rupture the sky. The water beneath ‘the Burj’ erupts day and night; the former sound-tracked by soprano Dame Kiri Te Kanawa scaling a Puccini aria; the latter to Arabic pop, the water whirling like a dervish. They think of a city in which food isn’t served to nourish but to amaze. At Morimoto, a restaurant from Japanese iron chef, Chef Morimoto, I anticipate a simple dish when I order sashimi. It arrives stacked in stripes of salmon, eel, Hamachi, toro and tuna with plastic pipettes criss-crossed in a pile like a game of Pick-up Sticks, each filled with a different sauce. A waiter instructs me on how to make the flavours best manifest. “Eat it all together,” he says, pointing to the teetering tower of fish. In global cities such as Dubai, in restaurants such as Morimoto, when you ask for sake, a sake sommelier materialises tableside with a selection. His name is Roni and he’s from Calcutta. Morimoto’s own brand of sake, Roni says, uses water that’s 100 years old. “Think of all the people that were born and died,” he says. The clang and clank of development is as much part of Dubai’s aural identity as its call to prayer. Just one-and-a-half hours inland, however, it’s so quiet you find yourself in bed before realising it’s not yet 10pm. Hatta’s only built attraction is a heritage village showcasing traditional Emirati life in rooms where the buttons no longer work. It’s screaming for a refurb. Yet sitting on the rim of a dried-up well, mountain breeze blowing, nothing to see and nowhere to be, is an ideal way to comedown from Dubai’s overstimulation. The hotel’s activities are endearingly dated: archery, air gun shooting and an enclosure of peacocks and turtles. In Dubai city’s lavish pool clubs, DJs spin records in the middle of swim-up bars. In the pool area at Hatta Fort Hotel, the speakers are encased in sturdy weatherproof domes. You can only hear the music if you stoop low enough to touch. I’m here on a busy weekend; the day before the Prophet Muhammad’s birthday. 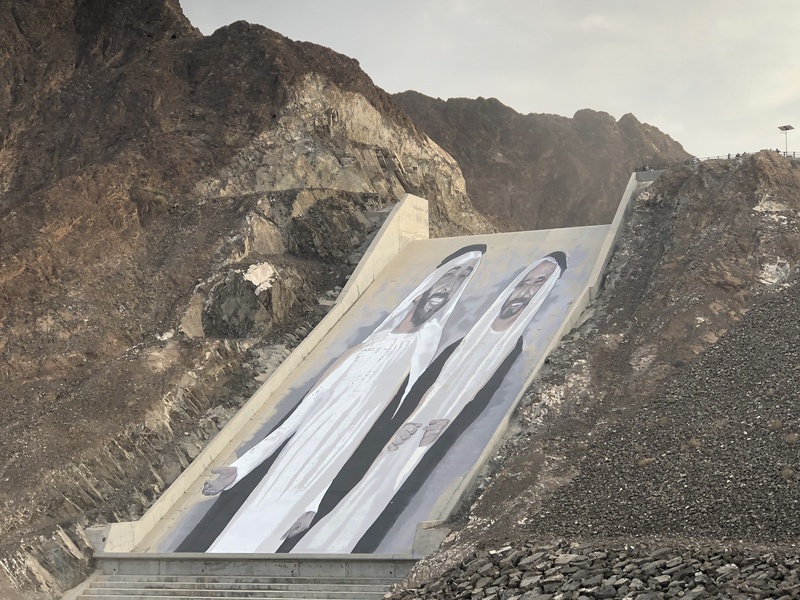 The road to Hatta dam will be jammed, says Nabeel, who recommends I walk. He is surprised I am so thrilled but four days in Dubai has left me desperate to reach somewhere, anywhere, on foot. The city had been no place for pedestrians: the heat, the walkways dead-ending in development, the assumption by every hotel employee that you’ll exit the revolving door and dive straight into an air-conditioned cab. 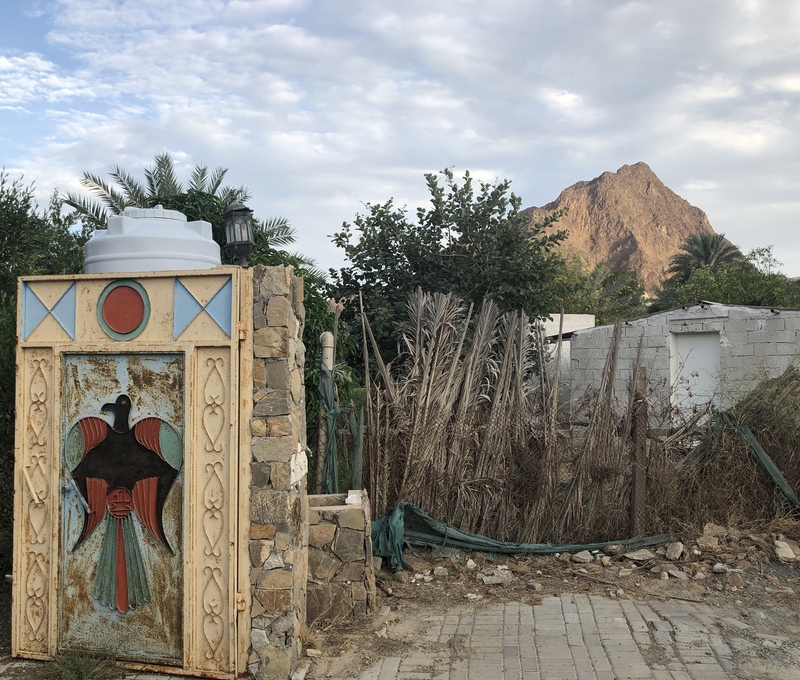 It’s reliably seven degrees cooler in Hatta and the path to the dam meanders through farms, ferns, date palms and locals tending crops. I round a corner and find a family picnicking in a rocky field; cooking over an open fire close to their 4WD. By the time I reach the dam, the mountains’ cragginess is softened by sunset. Emirati and Indian families wander along the crowded rim taking photos arranged to appear as if they’re the only ones here. Two local women are deep-frying gaimat – doughy balls sweetened by rosewater and orange blossom. It’s the only snack available. The dam is lovely but the mural impresses me more. It’s of Sheik Zayed Bin Sultan Al Nahyan and Sheik Rashid Bin Saeed Al Maktoum – painted by a German street artist. The men, both dead, united the seven Arab Emirates into a single sovereign monarchy in 1971. Now they’re on a mountainside, grinning in perpetuity, 80 metres high and 30 metres wide. I return to Dubai the next day on Emirates Road, which extends into Saudi Arabia. Buildings and nonsensical billboards – ‘The Future Begins Here’ – begin to dominate the dunes as we pass places named for their purpose: Academic City, Knowledge Village, Motor City and International City. Cranes creep into every horizon and the sound of metal and stone returns to the air. The outskirts of this city, you realise, will always be underway. As for Hatta, the Dubai government has Meeras on the job. Among other rather epic developments, Meeras built the Blvgari resort and residences, as well as Jumeira Bay, described as “a six million square feet mixed-use island, sculpted in the shape of a titanic seahorse riding the arcs of sand and rock.” Wresting Hatta into shape will be as easy as swatting a fly that’s already been sprayed. Things will be lost but gained too. 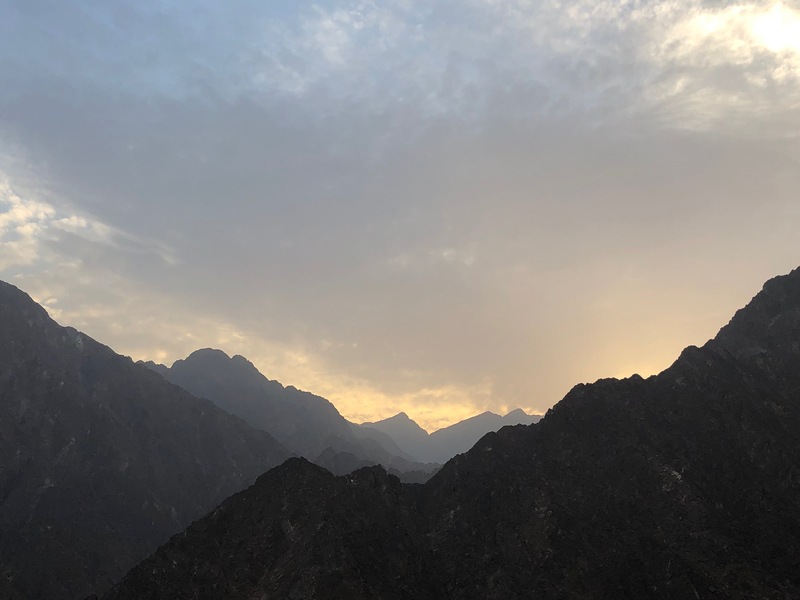 Hatta’s charm is how its simplicity thrives in the shadow of the city’s excess but if part of Meeras’ plan is a couple of interpretative walking trails, I’d not complain. Because I learnt nothing about the Samr tree when I was there – a native tree that resists desertification and has medicinal uses. I didn’t learn about the Arabian Oryx either. I learnt about both on the Meraas website in a press release called The Hatta Comprehensive Development Plan. So it goes.